Nokia 8 is a high-performance smartphone designed with content creators in mind. It is the first Nokia Android phone to come to Singapore. 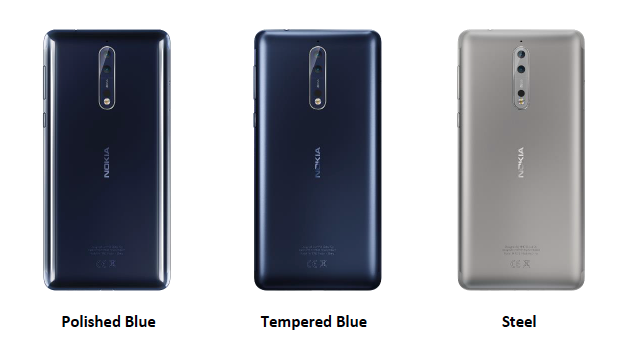 Nokia 8 will be available in Polished Blue, Tempered Blue and Steel at a suggested retail price of S$769 from tomorrow through sole distributor A-Mobile at all M1 Shops, Courts, Harvery Norman, Challenger, Sprint Cass, Mustafa, Handphoneshop, 3Mobile and selected A-Mobile authorised retailers. Nokia 8 offers Dual-Sight video to be live-streamed natively and in real-time to social feeds such as Facebook and Youtube by simultaneously harnessing both the front and rear cameras in a split screen visual for both photos and videos. Nokia 8 is the first smartphone to feature Nokia OZO Audio, placing exclusive Hollywood technology in the palm of your hand. OZO spatial 360° audio brings a fully immersive audio experience to your 4K video. Leading-edge 360° audio capture ensures the playback lets you truly relive the moment so your memories never fade. It is 4.6mm thin at the edge and 7.3mm slim on average. Select models feature a high-gloss mirror finish. The phone is powered by Qualcomm Snapdragon 835 Mobile Platform and runs the latest pure, secure and uncluttered Android with monthly security updates. It can deliver 11 hours of 4K video playback on a single charge. The device is secured with biometric fingerprint authentication.